I’m Ready to Sell My Paintings, How Do I Price Them? So you’ve run out of room in your studio and you’re thinking of selling your art. There are numerous avenues for selling. You can sell in a gallery, at an art fair, online shops like Etsy or Society6, open studios, at coffee shops and the list goes on. But how do you decide how much to charge for your paintings? As an artist, you need to understand that your art is your personal expression of creativity which comes from within you. When you talk about selling, then that’s real-world market forces at work affecting pricing. The better you understand how the art market works and where your art fits into the big picture of all art for sale at all the places where art is being sold, the better prepared you are to price and sell your art. In reviewing the threads on the Acrylic Pouring Facebook group and around the web, there are pricing themes that emerge. Here is a summary of that information that I hope will be helpful to you! A good starting point for you is to price your work based on time, the cost of your labor, and cost of materials. Pay yourself a reasonable hourly wage, add the cost of materials and make that your asking price. The US Department of Labor Occupational Labor Statistics lists the mean hourly wage of Fine Artists as $23.22. Use this as a starting point for figuring out your hourly wage. For example, if materials cost $50, you take 20 hours to make the art, and you pay yourself $20 an hour to make it, then you price the art at $450 ($20 X 20 hours + $50 cost of materials). If you go over 30 inches on either width or height, then it becomes $1.50 per square inch. New artists and those looking to break into the market may wish to start with a slightly lower multiplier than $1 per square inch. Well-known artists, those already in demand, can charge significantly more. To work out your price by the square inch, multiply the length by the width of your painting. For example, an 8 by 8 inch piece = 8 x 8 = 64 square inches. If you charge $1 per square inch, this would be $64 + the price of materials if you are adding that as well. In contrast to charging by the square inch above, you may also wish to consider charging by the linear inch. This will make much more sense if you offer your art in a wide range of sizes. Using square inches as above is sensible if your art is typically all of a similar size. However, for art that varies between very small pieces to very large pieces, square inch charging can create oddities at both the lower and higher end of your scale. Again you can choose to add the cost of your materials on top. Top Tip – consider the sizes of your typical artwork and work yourself out a table of charges on each of the three methods above. See which one of these methods seems most sensible to you. If it’s sensible to you, it’s sensible to your potential buyers too. Keep in mind that even though your art is unique, people make price comparisons from artist to artist all the time. Being able to evaluate your art by comparing it to that of other artists in your area, is necessary in order for your price structure to make sense in the marketplace. Prices may also vary regionally with smaller local art galleries achieving lower prices than top New York galleries. Buyers will typically expect to pay more at a smart gallery than at a small local craft fair. Be prepare to price your art according to your venue and your audience, without undervaluing your work. 1. Plan ahead. Don’t price things at the last minute. This can lead to outrageously high or low prices depending on your mood, current economic situation, or desire for attention. 2. Low pricing often signifies that the artist doesn’t have confidence in their work. On the other hand, if you are an emerging artist, asking for $5,000 for a painting might be over the top. Prices can go up, but they should never go down. Use common sense. 3. Most artists undervalue their work; often make less money on sales than they spent making the work. It is a good idea to keep track of your expenses and the time spent creating the work. You can defend your prices – even to yourself if you need to. If you have kept track of your time and expenses, you can defend the price of your work should a gallery or collector insist they are too high. Be realistic here, but also include your direct expenses for materials, as well as your overhead expenses such as studio rent, utilities, phone, etc. Never make your art so inexpensive that people will not take it, or you, seriously. 4. Discounts. Always have a price list available that states the full retail price. If you are selling the work yourself, always include the discount policy in writing on the price sheet. This will get you out of a bind if a buyer brings it up. 5. Commissions. Usually galleries and art consultants take a 50% commission of all sales. If the commission is less than 50%, do not lower the price. Often there will be a wide range of excuses for higher commissions, including that you are an emerging artist, your work costs more to sell, etc. Do not buy it! Many nonprofit galleries take from 0-30% commission and many leave the negotiation and the setting of the selling price up to the artist. 6. Increasing your price. The best time to increase prices is when you are experiencing a consistent degree of success and have established a proven track record of sales that has lasted for at least six months and preferably longer. You should also be selling at least half of everything that you produce within a six-month time period. As long as sales continue and demand remains high, price increases of 10-25% per year are in order. As with any other price-setting circumstances, be able to justify all increases with facts. Never raise prices based on whimsy or personal feelings. 7. Online sales. 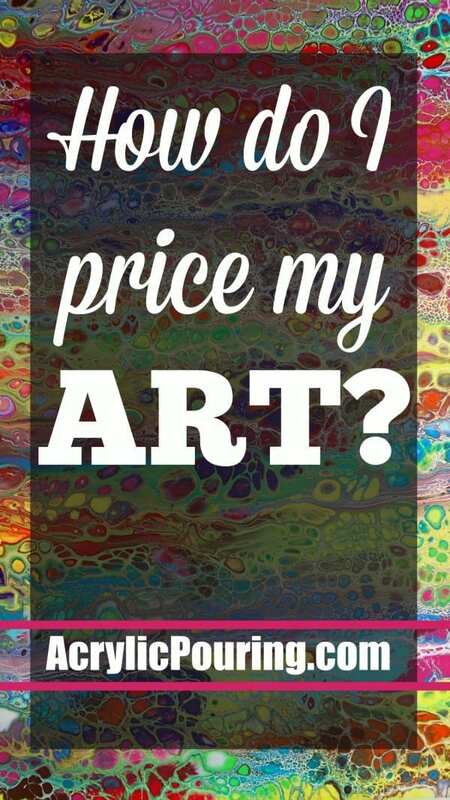 Here again is where you want to continually compare your prices to available art in your area, as well as on the Internet, and not just among your circle. Have a good selection of reasonably priced works available for purchase. Give the buyer the option of starting small, without having to risk too much money. The more you are aware of market forces in general, and how people respond to your art in particular, the better prepared you are to maintain sensible selling prices and to maximize your sales. Thank you so much for this information. Pricing is always a stumbling point for me and my fellow artists. It is great to have some guidelines to help us. Thank you so much for this information. The square inch amount is determined by the type of art becuz some have more expensive materials and/or require more time. Frames and shipping are additional. This way of figuring out how to price seems crazy. So you can have a painting that took twenty minutes to make, and one that was detailed and realistic, and they may be priced the same? Great information and thank you. I do pourings and abstracts on 78 vinyl records. How would i price these and also how does one determine shipping costs? Any help is appreciated. Thank you.